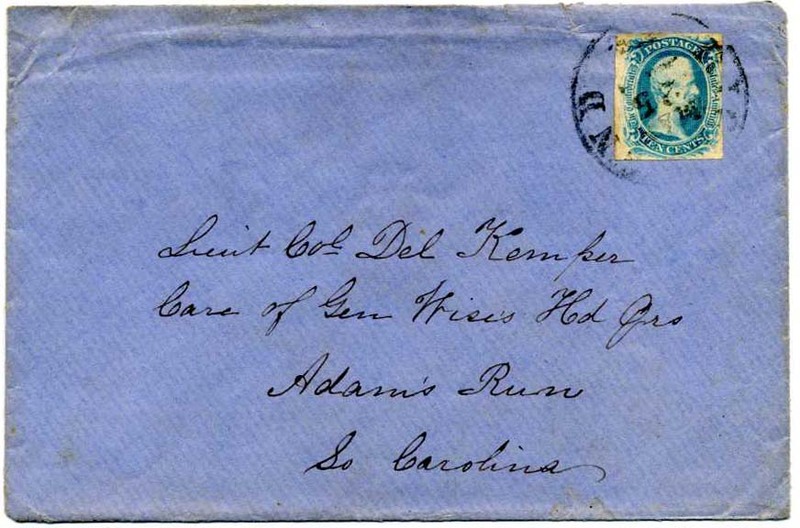 CSA 9, 10¢ blue "T-E-N", 3 margins, tied part strike RICHMOND / VA. cds on homemade cover to "Mrs. S. C. Gladfelter, Catawba Station, N.C.", Nice copy of this scarce issue. 2008 SCV $1,600. CSA 9, 10¢ gray blue "T-E-N" tied by indistinct cds on homemade cover to “Mrs. 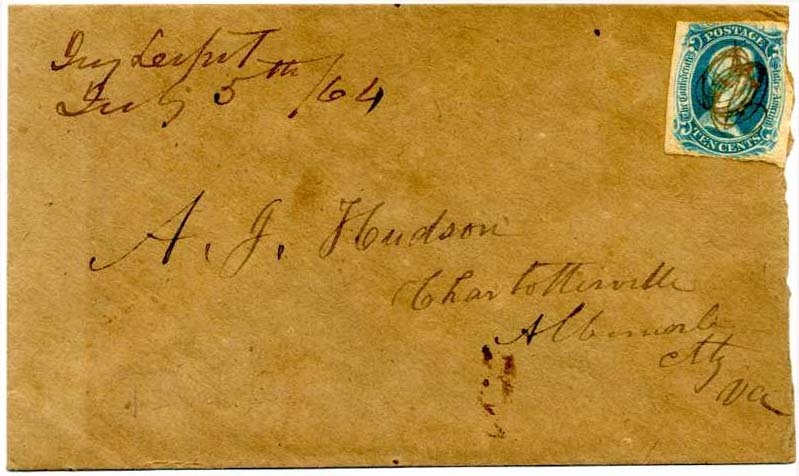 H. C. Brown, Greenville, Ala.” on homemade cover, signed/guaranteed by the illustrious Stanley B. Ashbrook as having come from the Richey collection, 2008 SCV $1,600. 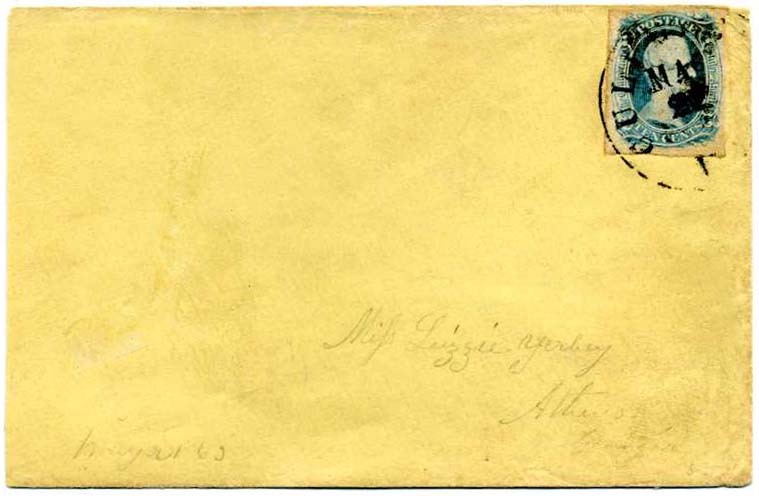 CSA 9a, 10¢ milky blue "T-E-N" (faulty) tied RICHMOND / VA. cds on clean blue commercially made cover to Lieut. Col. Del Kemper, Care of Gen Wise’s Hd Qrs, Adams Run, So Carolina, 2010 SCV $1,600. $1,200. 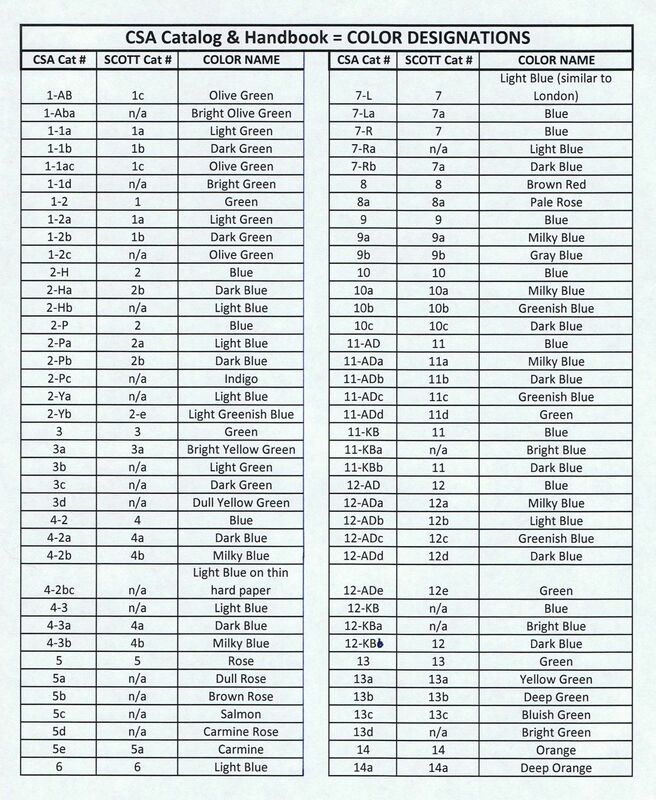 Delaware B. Kemper (1833-1899) enlisted 4-17-61 (day Virginia seceded) as a captain in the VA Alexandria Light Artillery and rose to Lt. Col. by 3-2-63. He was wounded at 2nd Manassas in the shoulder (military records included). He was appointed U.S. Counsul to China by President Grover Cleveland. 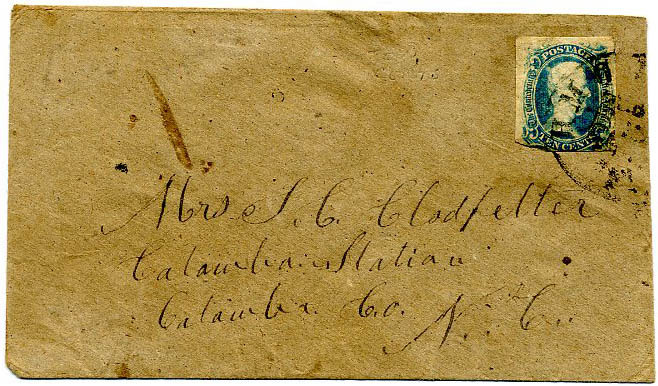 CSA 9, 10¢ blue "T-E-N" (4 lovely large margins) tied neat bold CLARKSVILLE / Va. // MAR / 17 balloon cds on small cover front (no back flaps) addressed to Mr. Thos Terry, Woodsworth, NC which has been crossed out and redirected to Manson, also crossed out. $650. 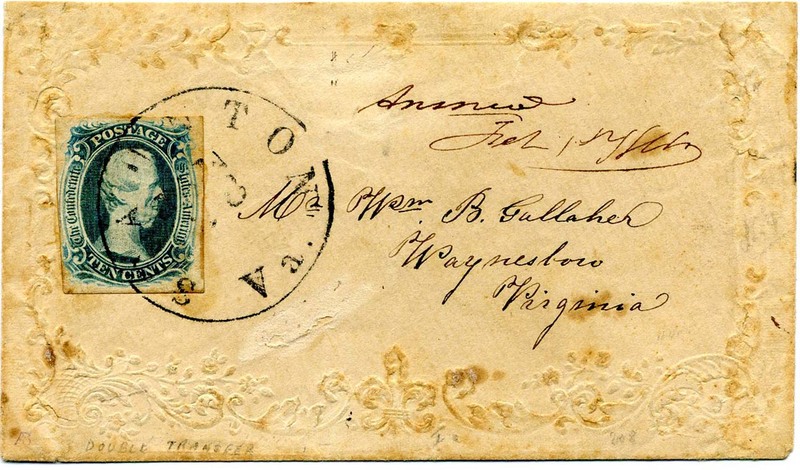 CSA 9, 10¢ blue "T-E-N" tied pen strokes and manuscript cancel of “Pamplin’s Depot Va / Aug 24” on homemade cover, slight cover reduction at bottom, 2000 CSA Certificate #03756. $500. CSA 9a, 10¢ milky blue "T-E-N" used with usual scribble obliteration and matching “Ivy Depot [Va] / July 5th / 64” manuscript cancel on fresh homemade cover to A. J. Hudson, Charlottesville, Albemarle Cty, Va.; somewhat roughly torn open at right, scarce; Ex Thacker. $600. 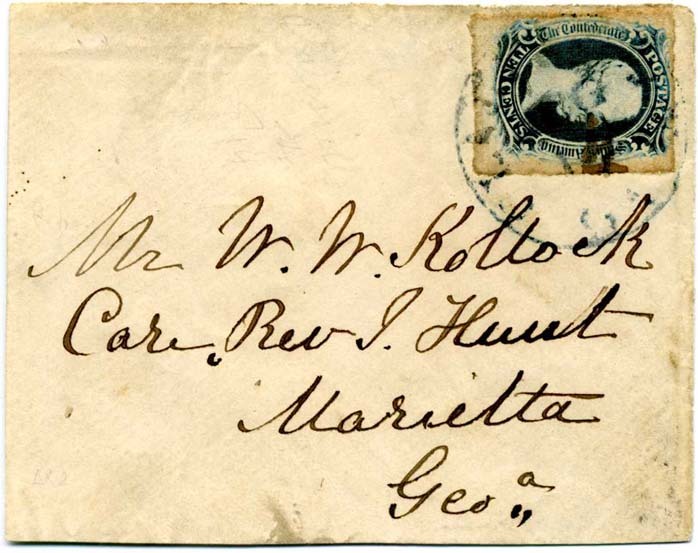 CSA 9b, 10¢ gray blue "T-E-N" with bit of gum staining along the edges, tied on large piece (no back) showing full address (I pondered with to call this a cover or a piece) by blue BLAIRSVILLE / GA cds to Mr. W. W. Kollock, Care Rev. J. Hunt, Marietta, Geoa. W. W. Kollock served in Co. B of the Georgia Hardwick Mounted Rifles, later consolidated into the 7th Georgia Cavalry Regiment in February 1864 where it became part of the Army of Northern Virginia. The main objective of the Hardwick Mounted Rifles was to defend against Union invasion along the Georgia coast and protect the towns and homes of these Southeast Georgia coastal counties. $550. 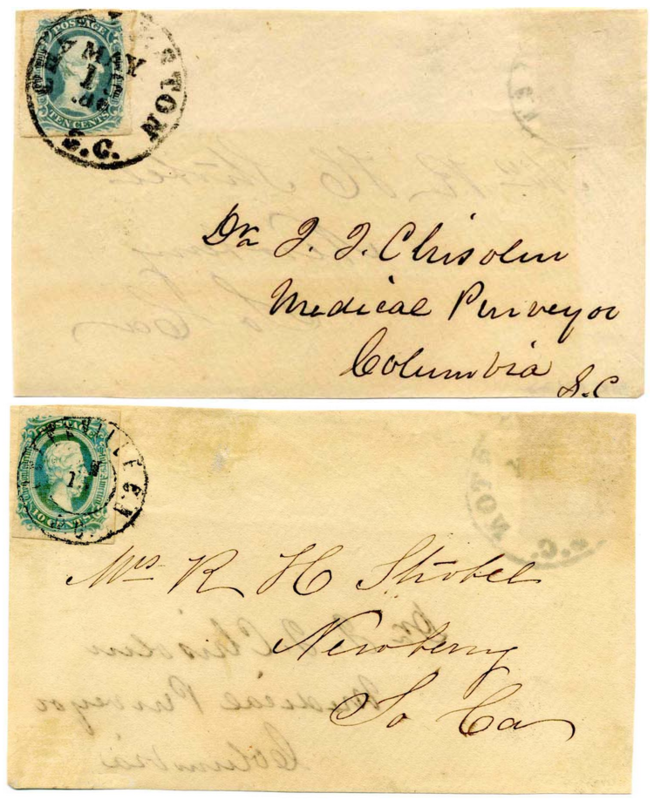 CSA 9a, 10¢ milky blue "T-E-N" (4 margins) tied by bold crisp CHARLESTON / S.C. // MAY / 16 cds on pristine cover front (no back) to Dr. J. J. Chisolm, Medical Purveyor, Columbia S.C.; other side CSA #11, 10¢ blue 4 margin copy tied neat GREENVILLE / S.C. double circle pmk addressed to Mrs. R. H. Strobel, Newberry, So Ca. This comes with a bio of the amazing Dr. Chisolm and will be the focus of one of my columns “The Confederate Post” in The American Stamp Dealer & Collector. Ex Henry Welch. $1,200. Dr. John Julius Chisolm (1830-1903) was also known as Julian John Chisolm and J. J. Chisolm. He received his M.D. degree from the Medical College of the State of South Carolina in 1850 and continued his studies in Paris, with an emphasis on eye surgery. In 1859, he returned to Europe to observe the treatment of the wounded from European battles at that time. In 1861, shortly after the outbreak of the War, Dr. Chisolm published the first edition of A Manual of Military Surgery. Dr. Chisolm was appointed to the rank of surgeon in the Confederate Army on September 20, 1861. 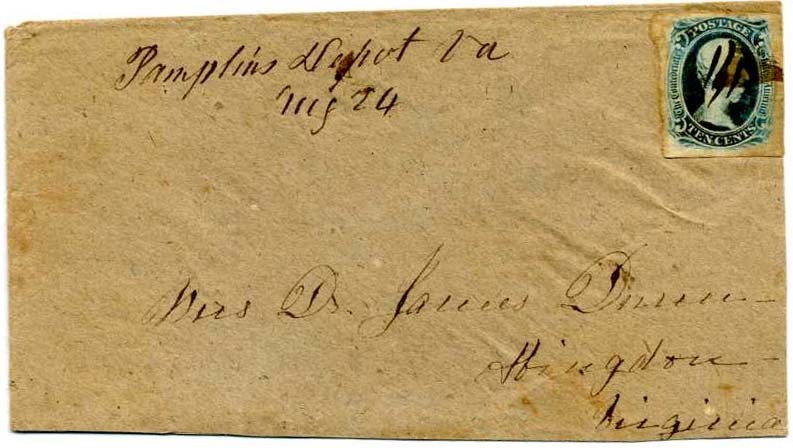 In November, 1861 he was ordered to Charleston to establish a medical purveyor's office for receiving and distributing medicines and surgical instruments to Confederate military physicians in the field and in hospitals. Following the war, Chisolm moved to Baltimore, Maryland to accept a special chair of eye and ear surgery created for him by the University of Maryland. He made many contributions to medicine and surgery in his teaching, his more than 100 professional publications, his inventions, and his founding of institutions. Chisholm was among the first to surgically remove cataracts and to use cocaine in eye surgery. He is considered one of the fathers of American Ophthalmology. 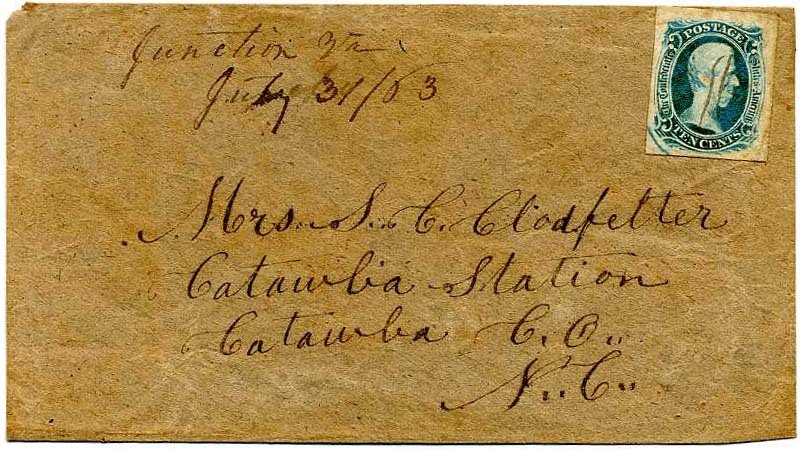 CSA Catalog 9-v6, 10¢ blue "T-E-N", damaged plate variety with major plate bruise in lower left corner margin, full to large margins, manuscript canceled with "Junction Va. / July 31 / 63" manuscript postmark on homemade cover to Mrs. S. C. Clodfetter, Catawba Station, N.C., stamp with vertical creasing, otherwise Very Fine, a scarce on-cover example of this variety, [VA] [SC], SCV as normal stamp on cover $1,600. $1,200. 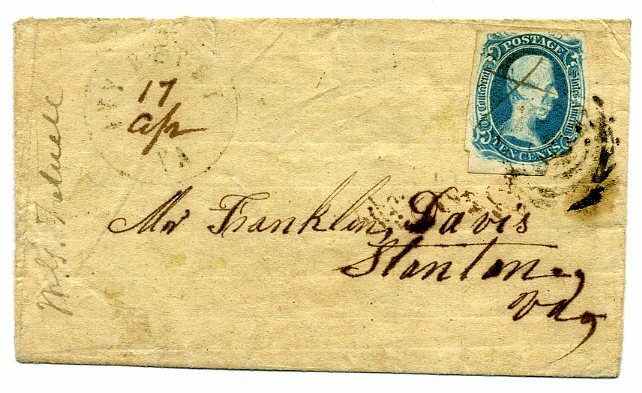 CSA 9, 10¢ blue "T-E-N" (bit of gum stain and tiniest edge tear in margin only) tied neat RICHMOND / VA. // MAY / 2 / 1863 on pristine homemade cover to W. S. Blakemore Esq., Sangersville, Sangersville, Augusta Cty, Va. SCV $1,600. $1,000. 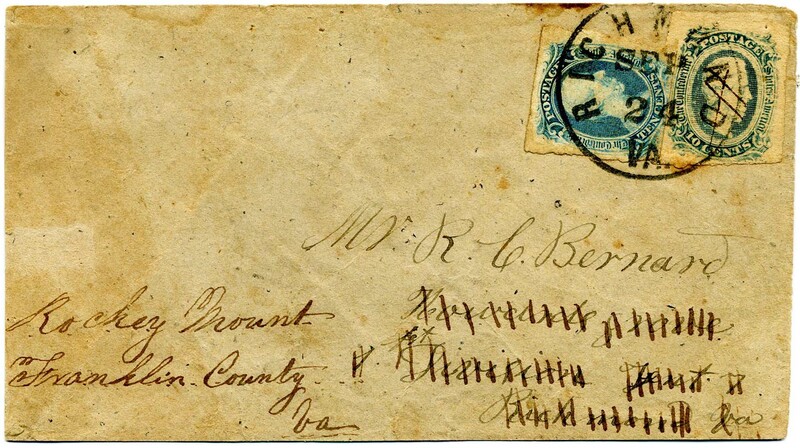 CSA 9, 10¢ blue "T-E-N" tied bold CHATTANOOGA / TENN // JAN on cover to Miss Jennie Russell, Louden Tennessee, tiny bit reduced at left, Ex Bush, SCV $1,600. $800. 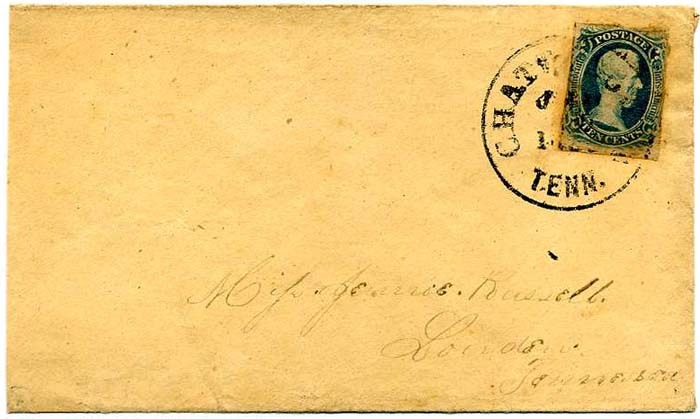 CSA 9, 10¢ blue "T-E-N" margins all around, tied by PITTSBORO [NC] cds on cover to Capt. Claude B. Denson, Care of Capt. Jno. Grant, C.S.A., Camp of Top[igraphical] Engineers, Magnolia, Duplin County N. Carolina, 2014 SCV $1,600. $900. Capt. Claude B. Denson served in the 2nd Confederate Engineer Troop, Company as well as in Co. E, 20th N.C. State Troops, known as the Duplin Greys or Confederate Greys. He was an engineering graduate from VMI and assigned various engineering duties in NC and VA. The regiment stayed on duty at Smithville (now Southport) until June 1862. He surrendered in Greensboro 1865. He served as a leading figure in military education prior to the war as commandant of the Franklin Scientific and Military Institute in Duplin County. CSA 9, 10¢ blue "T-E-N" tied CULPEPER C.H. 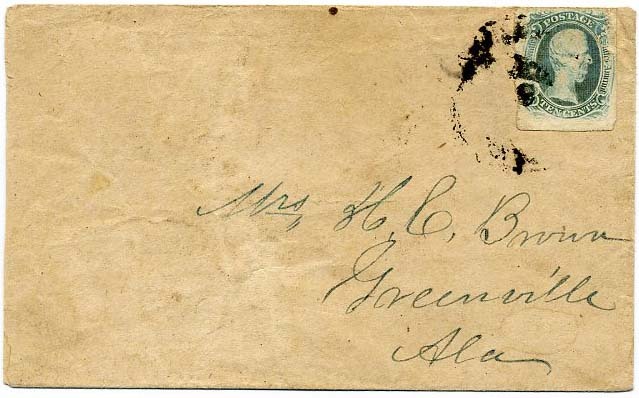 / Va. // MAY / 22 cds, partially struck off top right edge of cover addressed to Miss Lizzie Yerby, Athens, Georgia; slightly reduced at left. The Yerby family was a wealthy family with a large plantation and large population of slaves. $700. 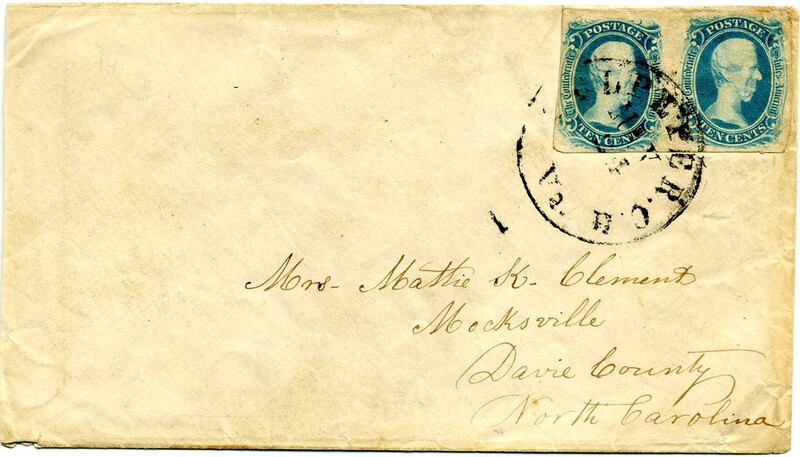 CSA 9, 10¢ blue“T-E-N” (stamp with rounded LL corner) tied grid with matching FARMVILLE / Va. // JUN / 2 / 1863 (inverted) cds on back flaps of small commercially made laid paper ladies cover to Mrs. 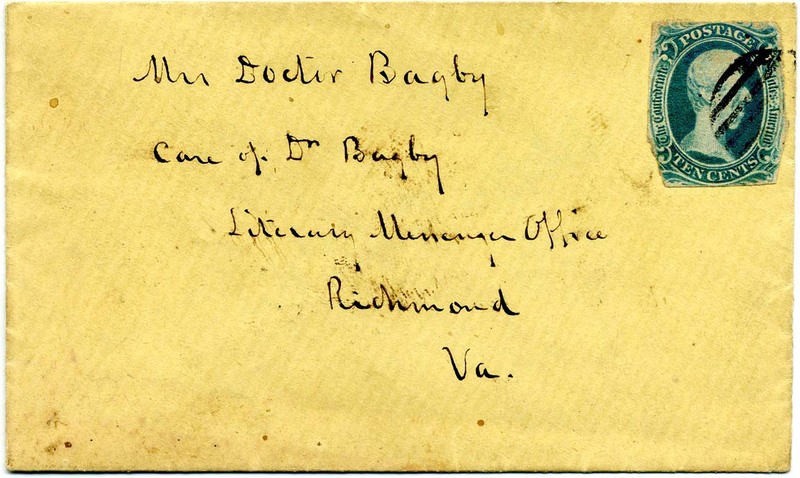 Doctor Bagby, Care of Dr. Bagby, Literary Messenger Office, Richmond, Va. SCV $1,600. $500. George William Bagby was editor of the Southern Literary Messenger in 1860. He served as a private in Co. A. VA 11th Infantry as well as Co. F, VA 3rd Battalion Reserves. Much more information on linked page. 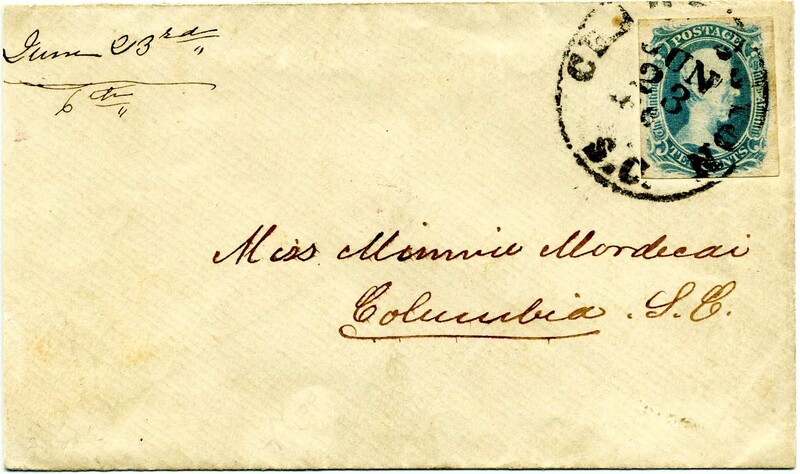 CSA 9, 10¢ blue“T-E-N” (3 margins) tied light strike of LEXINGTON / Va. cds on homemade cover to John A. 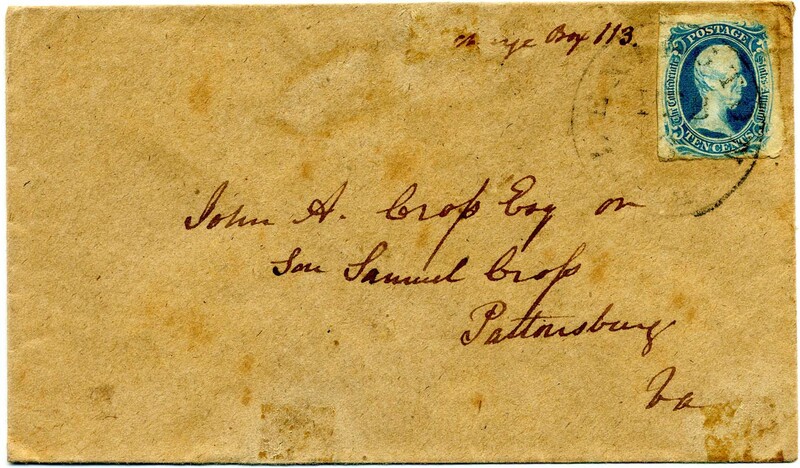 Cross, Esq or Son Samuel Cross, Pattonsburg, Va.; bit of light cover staining. Plantation Collection. SCV $1,600. $800. 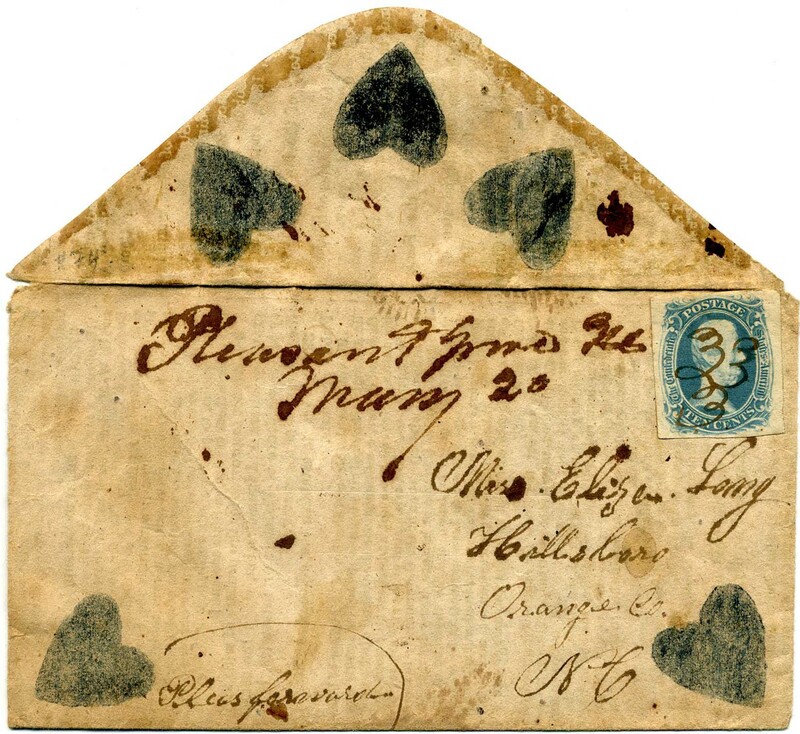 CSA 9, 10¢ blue “T-E-N” with large margins all around, manuscript cancel with matching “Pleasant Grove NC May 20” postmark on charming adversity cover made from printed legal act, embellished with blue hearts front and back, addressed to Miss Eliza Long, Hillsboro, NC. A totally delightful use, rare thus. $2,500. CSA 9, 10¢ blue “T-E-N” tied neat RICHMOND / VA // MAY / 11 / 1863 cds on commercially made cover to Miss Sallie E. Wise, Columbia, S.C. with neat embossed garter on the top back flap tip under which is the classic “OK Dietz” in his distinctive tiny black penmanship. Very Fine, SCV $1,600. Ex Katz. $1,400. 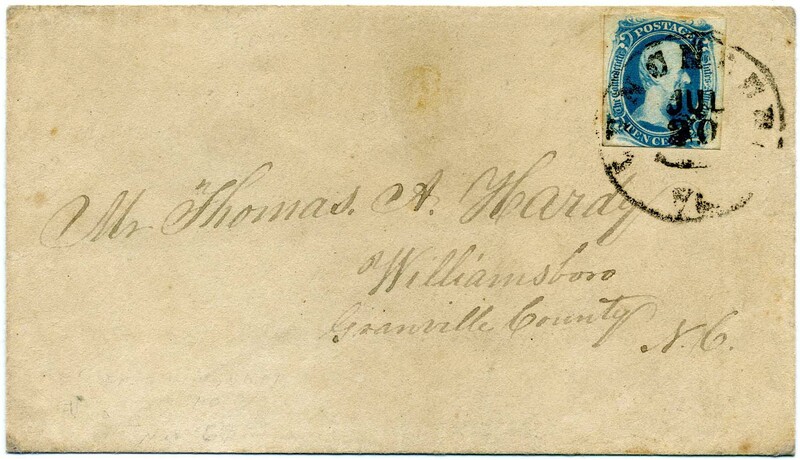 CSA 9, 10¢ blue“T-E-N” tied neat LYNCHBURG / VA. // JUL / 20 cds on cover which has been professionally restored to Very Fine appearance, addressed to Thomas A. Hardy, Williamsboro, Granville County, NC. SCV $1,500. $500. Thomas A. Hardy's daughter married Union general and Medal of Honor recipient Arthur MacArthur despite protests of her father and brothers; she became the mother of General Douglas A. MacArthur. Article following this fascinating family dynamics forthcoming in the 1Q 2018 issue of La Posta. More information on linked page. 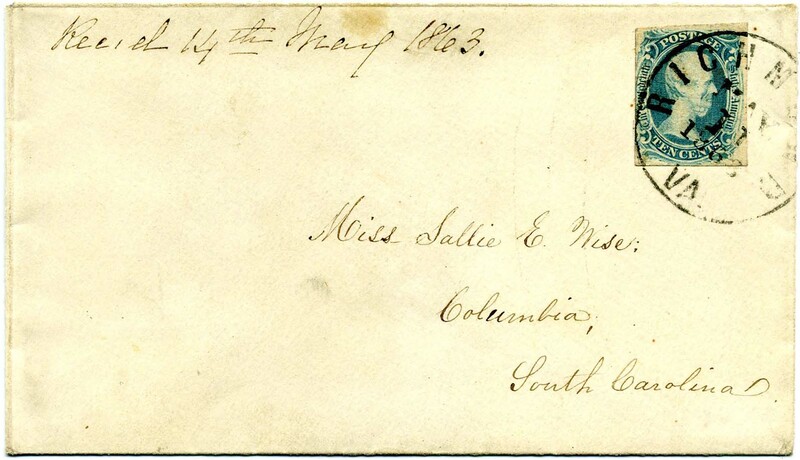 CSA 9, 10¢ blue “T-E-N” (4 margins), tied CHARLESTON / S.C. // JUN 23 CDS on neat commercially made envelope addressed to “Miss Minnie Mordecai, Columbia, S.C.”, slightly reduced at left. A choice use with a great story. Ex Cantey and Felton. $1,300. Hon. Moses Cohen Mordecai was an importer of fruit, sugar, tobacco, and coffee. He was Charleston’s most prominent Jewish citizen in the decades before the Civil War. Much more information on linked page. 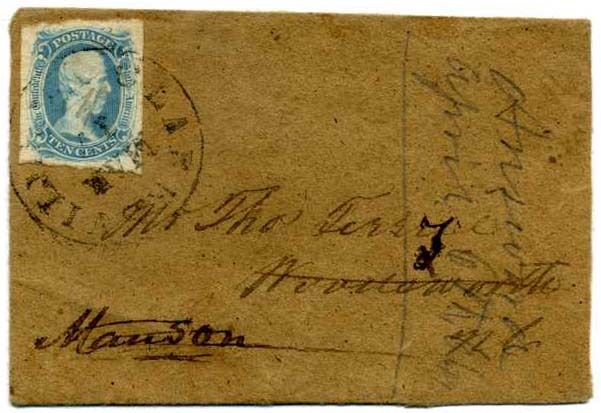 CSA 9, 10¢ blue, "T-E-N" used as FORWARDING postage and tied RICHMOND / VA. // SEP / 24 cds on incoming cover to R. C. Bernard, Howards Grove [Hospital], 1st Division, Tent 7, Richmond Va., with ms. CSA 11, 10¢ blue applied at origin, readdressed to Rocky Mount, Va., with "T-E-N" stamp added at this point, minor gum toning, bottom flap added, VERY SCARCE COMBINATION OF STAMPS with great backstory of wounded soldier. $1,600. Robert Clay Bernard served in Company K, 10th Virginia Cavalry. Howard’s Grove Hospital was large, with a total of 62 buildings. Much more information on Bernard and Howard's Grove Hospital on the linked page. 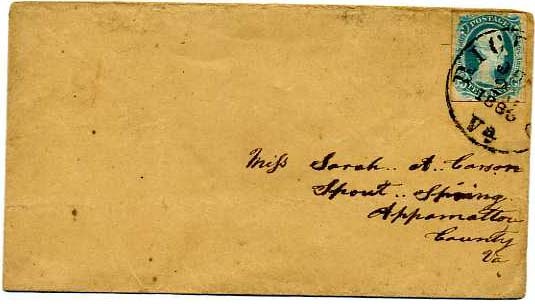 CSA 9a, 10¢ milky blue “T-E-N” tied RICHMOND / VA. cds on homemade cover to Miss Sarah A. Carson, Spout Spring, Appomattox County, Va. $900. 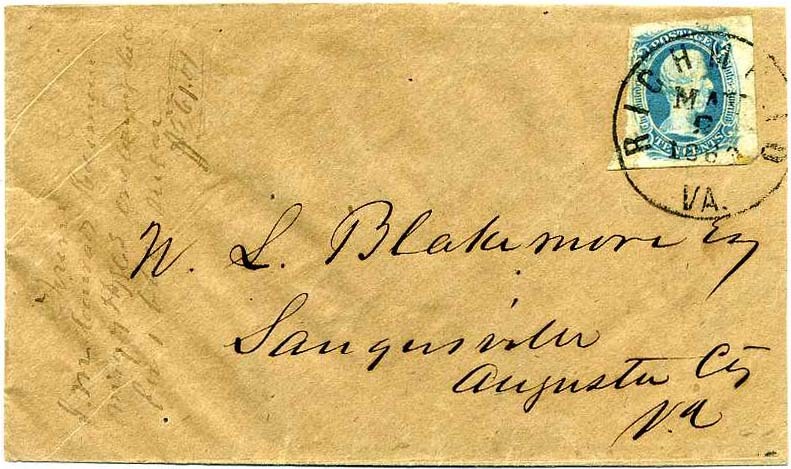 CSA 9, 10¢ blue "TEN" with clear DOUBLE TRANSFER in "TEN CENTS," tied by STAUNTON / Va. // JAN / 28 cds on small embossed lady's cover to Wm B. Gallaher, Waynesboro, Va., reply docketing at top, bit of foxing, missing back flap and small rubbed spot below datestamp slightly breaks paper, Very Fine appearance, ex Wishnietsky, SCV $1,500 with no premium for the double transfer. $950. William Bowen Gallaher served in the 1st Virginia Cavalry and 5th Virginia Cavalry Army of Northern Virginia (Fitzhugh Lee). Much more information on linked page. CSA 9, 10¢ blue "T-E-N,” slightest oxidation, tied by SHELBYVILLE / Ten. 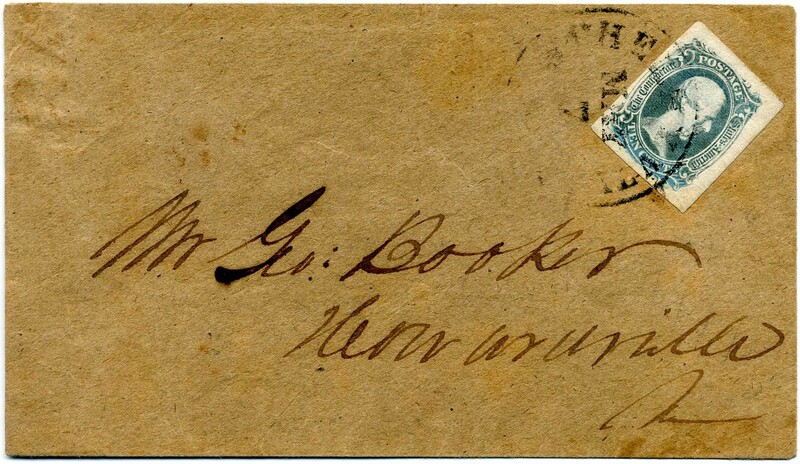 // MAY / 7  cds on fresh homemade cover to George Booker, Howardsville, Miss., Extremely Fine, SCV $1,500. $1,000. CSA 9, 10¢ blue "T-E-N" HORIZONTAL PAIR paying the double rate, large margins except where clear or touching left stamp, beautiful rich color, tied by CULPEPER C.H. / Va. // MAY / 24 cds on fresh cover to Mattie K. Clement, Mocksville N.C., faint toning at right edge just touches pair otherwise Very Fine. RARE "TEN" MULTIPLE ON COVER, ONE OF THE FINEST KNOWN. Ex Caspary, Muzzy, Everett, Kilbourne. SCV $3,000. $2,900. 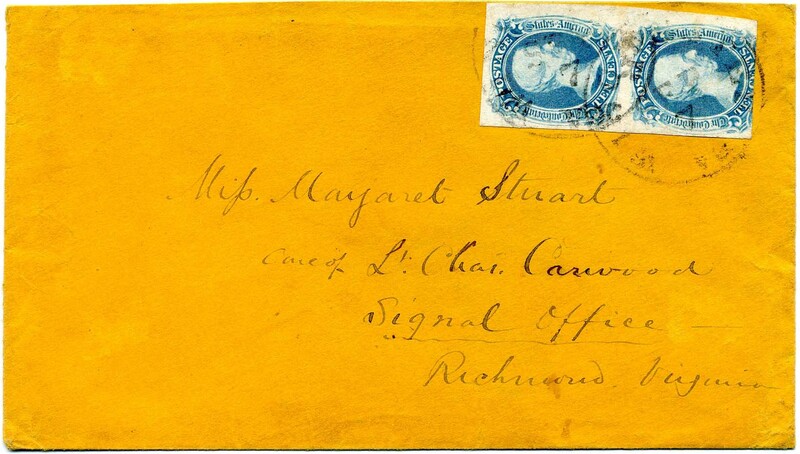 CSA 9, 10¢ blue "T-E-N" VERTICAL PAIR paying the double rate, huge margins to in at bottom, right color, tied two strikes of light WINCHESTER / Va. // FEB / 7 cds on cover to Miss Margaret Stuart, Care of Lt. Chas. Carwood, Signal Office, Richmond, Virginia. The U.S. Army Signal Corps was born in June 1860 and the CSA Signal Corps, a smaller group, was formed the following year by Edward P. Alexander an assistant to the USA’s Albert J. Myer. Ex DuPuy. $1,900. 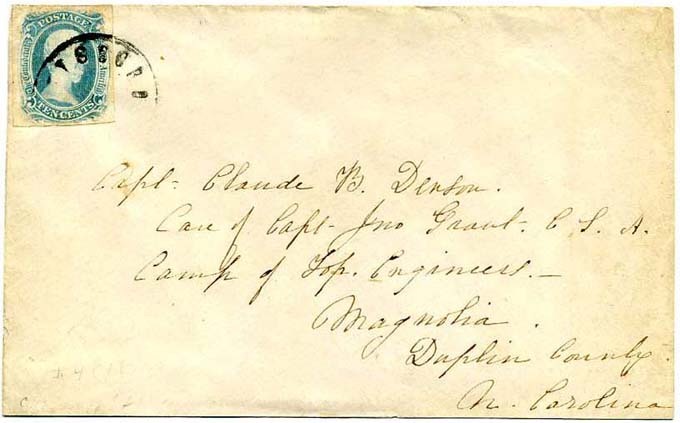 CSA 9, 10¢ blue T-E-N, unevenly separated margins, manuscript cancel with small IVY DEPOT / VA (17 Apr in ms.) cds and tied target cancel on small commercially made cover to Franklin Davis, Staunton, Va. - well-known nurseryman. Stamp with hairline transient “crack” on the head. SCV $1,600 as regular stamp on cover. $650.